These are the redback spider (Latrodectus hasseltii) and the katipo (Latrodectus katipo). Although other species of spider are known to bite, their venom is regarded as harmless to man. An example of this is the white tailed spider (Lampona cylindrata and L. murina), which has venom that is not known to cause harm in human exposures, however good wound care is still required. In some rare cases people may develop an allergic reaction following a bite. It is always helpful to capture the spider so that it can be kept and identified later should a bitten person become unwell. But you must be very careful you are not also bitten if you do this. Following a bite advice should be sought from your Poisons Information Centre. Dark brown to jet black in colour with a red stripe running down the length of its back. On the lower surface is a red mark shaped like an hourglass. Dark brown to jet black in colour with a red stripe running down the length of its back. The white tailed spider has a black to grey body, and can be readily identifiable by a distinctive small white patch at the end of its "tail". The young spider has several white spots down the abdomen, instead of a solid patch. Fully-grown spiders are about 15 mm in length with shiny black legs than can span approximately 28 mm in diameter. 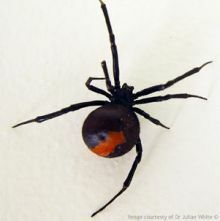 New Zealand has many species of spider of which only the redback and katipo are venomous to human. If you are unsure of the identity of a spider or concerned that it could be an exotic species, contact your Poisons Information Centre for further advice. It is important to remember that most spiders are not harmful and following good wound care symptoms are unlikely to develop. If symptoms of infection or illness occur contact your Poisons Information Centre or medical professional. If bitten there may be little or no local pain, a minor sting, or sharp "pin-prick"; people bitten during sleep may not be aware of the event. Some people can develop an allergic reaction to the bite. If the person is having difficulty breathing call an ambulance. If they develop a rash, temperature or general swelling take them to a Doctor. If an envenomation has occurred and the person is experiencing ill effects, ring your Poison Centre or seek medical advice. If these effects are severe, call an ambulance. Symptoms such as an upset stomach, abdominal pain, or localised sweating around the bite area, may indicate a serious bite. If any of these occur, contact the New Zealand National Poisons Centre. Contact your local Poisons Centre or Doctor.